Congratulations! You’ve made the first great step towards fully optimizing the online presence of your business by enrolling in the Lotus Program by BroadLeaf Marketing & SEO. Now that you’ve provided your account manager with all of the accurate business data to be listed on over 70 directories, you may be wondering what comes next. 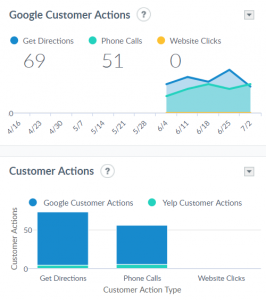 One of the most powerful features of Lotus is your monthly or quarterly analytics reports. With these detailed reports on your business’ online performance, you’re able to track the number of views your business receives, how many customers interact with your listings, and more! In this article, we will outline all of the data included in your reports, as well as how to understand these metrics. In order to best illustrate how to read your analytics reports, we will be featuring MAG Tattoo Studio located in League City, Texas. MAG Tattoo Studio is a brand new tattoo shop featuring a staff of incredible artists. The clean and friendly environment of MAG Tattoo Studio has quickly made them a local sensation, a fact which can be seen through their shining Lotus analytics report. If you’re a resident in or around League City, Texas looking for a new tattoo artist, you should definitely contact MAG Tattoo Studio. They proudly offer walk-ins and can transform any tattoo vision into a reality! 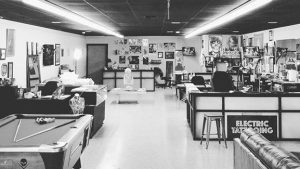 With over 7 years of experience and competitive prices, MAG Tattoo Studio is one of the cleanest and most pristine studios in Texas. If you find yourself overwhelmed by the detailed information of your analytics report, don’t worry! While we provide you with a ton of valuable analytical data, your account managers are always available to walk you through each section of your report, explaining what each metric means to you and your business. Continue reading below to view descriptions of each analytics report section! The Location Map section of your analytics report displays your business name, address, and a map marker of your business location. This section will contain the most important and informative analytical data. As the number one search engine in the world, it’s important to keep track of the number of times your listing appeared in search results, specifically on Google Search and Google Maps. The easy-to-read graph offers a useful visual representation of the performance of your listing’s Google views over time. 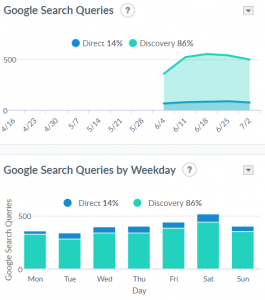 This section displays the number of search queries (information entered into the search engine by the user) that lead to Discovery and Direct search results as well as a breakdown of these numbers by day of the week. This section often causes confusion because the difference between Discovery and Direct results is not clearly outlined on the report itself. Discovery: Discovery results occur when your listing is displayed to the search engine user when their query includes goods, services, products, or categories. Direct: Direct results occur when your listing is displayed to the search engine user when their query includes your specific business name, address, and/or phone number. The Attribute Changes section is a breakdown of the number of attribute changes over the time period set for the report. Attributes are specific business data such as business name, address, phone number, hours of operation, featured message, business description, business website URL, photos, and more. This section is broken down into two columns. 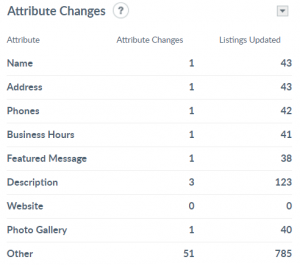 The first shows the number of attribute changes, and the second column shows the number of listings that have been updated as a result of these attribute changes. Attribute changes are rarely made to your core business data (Name, Address, Phone Number, Hours) after your initial enrollment unless requested directly by you. Your account manager updates your business attributes monthly (specifically featured message, description, keywords, and photos) to ensure that the search engines know your business listings are actively managed and relevant, which results in higher rankings! The Google Customer Actions section details the number of times consumers took action from your Google listing specifically. These actions include clicking the call button, requesting directions, or clicking on your website URL. A phone call action occurs when a consumer clicks the phone number on a mobile device, regardless of whether the phone call was completed. The next section of Customer Actions displays the same information as listed above, with the addition of the customer actions from your Yelp listing. We separate these two sections because Google is the most important search engine, and we know how valuable it is to see the customer actions for your Google listing on its own. Remember, the Google Customer Actions section displays Google listing actions only, and the Customer Actions section displays Google and Yelp actions. The Listings Device Usage section displays the number of time your listings appeared in search results on each device type. The device types are broken down into Desktop, Mobile, Tablet, and Unknown. Unknown devices are counted when Lotus was unable to determine the device type used to view your listings. 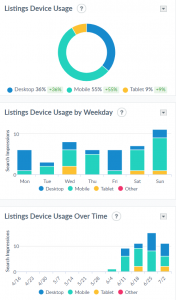 The Listings Device Usage by Weekday uses an easy-to-read graph to provide a visual representation of the number of times your listings appeared by device type, broken down by the day of the week. 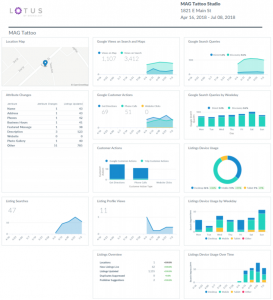 The Listings Device Usage Over Time Section provides a visual representation of the device types used to view your listing over a set time period. This time period will match the time period for the analytics report itself. These three sections help you to understand how consumers are seeing you online, allowing us to better cater your Lotus Program settings to reach the maximum amount of viewers possible. The Listings Overview section is a basic breakdown of the key metrics for your business location and listings and a percentage change from the previous period of the same length. In this section “Location” refers to your business itself, and unless you have multiple locations it will always display as 1. 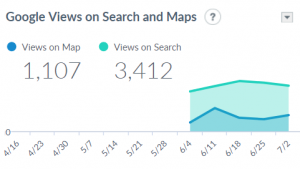 The key metrics listed in this section are New Listings Live, Listings Updated, Duplicates Suppressed, and Publisher Suggestions. New Listings Live refers to the number of new online directories your business data has been added to. Listings Updated refers to the total amount of listings updated. Bear in mind, some directories and search engines have affiliate sites which means your information is being displayed on all of the listings associated with the main directory provider! The Duplicates Suppressed metric outlines the number of listings with inaccurate or duplicate information that have been resolved by Lotus. The Publisher Suggestions metric is generated by the number of internet user edits submitted to your listings that were deemed correct and accepted by Lotus. This section provides details on the number of times consumers viewed your full listings profile on any of Lotus’ network sites. This metric does not include views on Google, Bing, or Yelp. 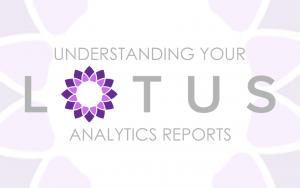 Now that we’ve detailed each section of your Lotus analytics reports, you can keep track of these metrics and use them to see how Lotus is truly benefiting your business’ online presence! 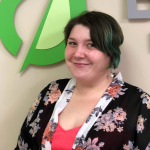 Remember, if at any point you find specific areas of your analytics reports confusing you can always contact your account manager or one of our customer service representatives to walk you through your reports as they’re sent out to you! Not enrolled in Lotus? Contact BroadLeaf Marketing & SEO to get your business seen across over 70 directories today!